Today is my birthday. Coincidentally it is also Lisa's birthday over at Lisa Writes. A blogging birthday buddy! Hurray! Since it is my birthday and I'm actually a really big fan of presents (and by that I mean, I sincerely love giving them) I'm going to do a giveaway here on this blog. 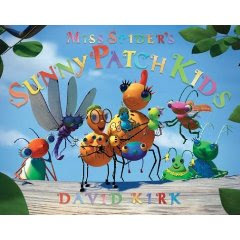 One blessed winner will receive a copy of Miss Spider's Sunny Patch Kids (hardback edition). I received a review copy of it and feel like passing it on for your good pleasure. Scroll through some of my old book reviews, select one, read it, and come back to this post. Tell me which review you read and what you thought of it. If you hated it, feel free to say so. Reading demands thought and if you think you don't like a book or something I said about it - say so! I will use random.org to select the winner. I'll keep the contest open through Sunday, September 7th. I will announce the winner Monday morning. Please make sure you've left a way for me to contact you if you win. Spread the word and the birthday celebration. Just popping over to return birthday wishes! May your day be full of joy! I loved your Pride and Prejudice review. You're right, while the film is great to watch, the book is so much better. And I completely agree: the 6 hour Colin Firth/Jennifer Ehle is the ONLY one to watch! Happy Birthday! I was just visiting from BTT. I agree with you about Austen. There's nothing like reading her witticisms. Happy Birthday!! I don't need to win, but I wanted to give you bday wishes. My dad's and Amanda's are both next week.